Dave instructs several kinds of Swing dancing: Lindy Hop, Charleston, Jitterbug, Shim-Sham, Balboa, and more. Lindy Hop is perhaps the most popular of these, and it is often used as an "umbrella term" which includes one or more of the others. Specifically, Lindy Hop (the dance) often implicitly includes Lindy Hop (the step) and Charleston (the step), and that is the way that Dancer Guy teaches it. The Lindy Hop is a swing dance that got its start in the Savoy Ballroom of New York in 1927, created by a man named "Shorty George" Snowden. It became the most popular dance in America and Europe in the '30s and '40s. Then in the '50s, it kind of fell out of favor when rock 'n' roll became popular, but then Swing came back strong in the '90s, and has been going strong ever since. The Jitterbug, also known as East-Coast Swing, is a six-count dance done to eight-count music. It is simpler in footwork than the Lindy Hop, and is therefore easier to learn, and it is also easier to do to fast music. For slow music, to "regular" toe-heel footwork becomes tediously slow, so it is fancified a bit by putting extra steps (making the triple steps) into the footwork. This makes Jitterbug less ploddingly slow when danced to slow music. It is common to intermix Jitterbug with other Swing styles, such as Lindy and Charleston, during a single song. That means that you need to smoothly transition from eight-count steps to six-count steps and back again. Going back to eight-count steps needs to happen at the appropriate time because, since the music is also in eight counts, if you don't return to eight-count steps at the proper time, you will be out of sync with the music for an extended period of time, and your dance will not look nearly as good as it could have. Dancer Guy teaches some Jitterbug basics during Lindy 2 classes, and also does dedicated Jitterbug classes. In both situations, he will instruct on how to smoothly transition between the Jitterbug with its six-count steps, and the Lindy or Charleston with their eight-count steps. In addition to the Lindy Hop, Charleston, and Jitterbug steps mentioned above, Dave also teaches the Shim Sham, a Swing line dance. This is a non-partner choreographed dance that originally was done as a tap dance, but as more and more people (including Swing dancers) learned it, more of the Swing "feel" crept in, and is now much less tappy than it was originally. The Shim Sham has a defined length, and when the choreographed portion is finished, people typically partner up with the nearest person and free-dance Lindy Hop or some other Swing style until the current song is done. 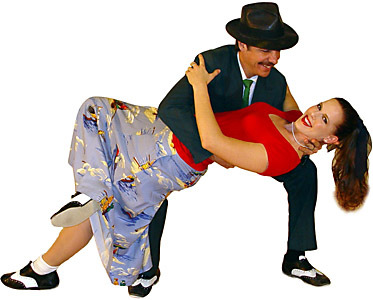 Another popular style of swing dancing is the Balboa, a very close chest-to-chest dance that was created in the 1930s on Balboa Island, off the coast of California. The dance floors there were so tiny and so crowded that doing standard Swing moves was impractical at best and dangerous at worst, so the Balboa was developed to allow people to dance while taking up the minimum amount of dance-floor real estate. The floor-space constraint was strictly enforced, and people doing large movescommon in normal Swing dancingwere kicked out of the clubs because they were "hogging" the floor. In northern Colorado and other places where dance floors are not so tiny nor so crowded as on Balboa Island, a modified version of Balboa is more often done. The modification incorporates some Lindy-like moves where the couple separates to do various moves, and then come together again in the Balboa frame when the moves are finished. Technically, this hybrid version of Balboa and more "normal" swing dancing is called "Bal-Swing," and that is the style Dancer Guy teaches, even though it is still usually referred to as "Balboa." Blues dancing is a little hard to categorize. It is certainly not a Ballroom style, and it is definitely not a Country style. Neither is it a Latin style, although it does share some attributes of Argentine Tango. And technically, Blues dancing is not exactly a Swing dance style either, but it is commonly associated with Swing, and is often danced by the same people who love Swing. So, with those caveats, it seems that this Swing page is the least mismatched place to talk about Blues. Blues is a relatively new style of dance, but it has taken the dance scene by storm. There are Blues dances, Blues workshops, Blues retreats, Blues competitions, and millions of adherents all across the world. Blues dancing is a very enjoyable dance that can be done to a wide variety of music and, like Argentine Tango, this style is not bound nearly so tightly to the music measures as many other dance styles are. There are three primary frames, or ways of holding on to your partner: the close embrace (chest to chest), the closed frame (more like a typical ballroom frame), and the open frame (only holding hands). The closed and open frames are used mostly for transitions, and the close embrace is by far the most commonly used. Leading is done through the man's chest, his hand on her back, and/or the thigh connection, right above the knees. Collegiate Shag is partner dance that was developed in the first half of the 20th century; probably in the Carolinas in the late 1920s. Even though Collegiate Shag came from the Carolinas, note that it is not the same as the Carolina Shag. Collegiate Shag has two main variations—single-rhythm and double-rhythm—DancerGuy teaches the single-rhythm variation.